book of my first nine photomontage series with an introduction by Elizabeth Avedon. The book is 11" x 11" in format and contains 125 images. 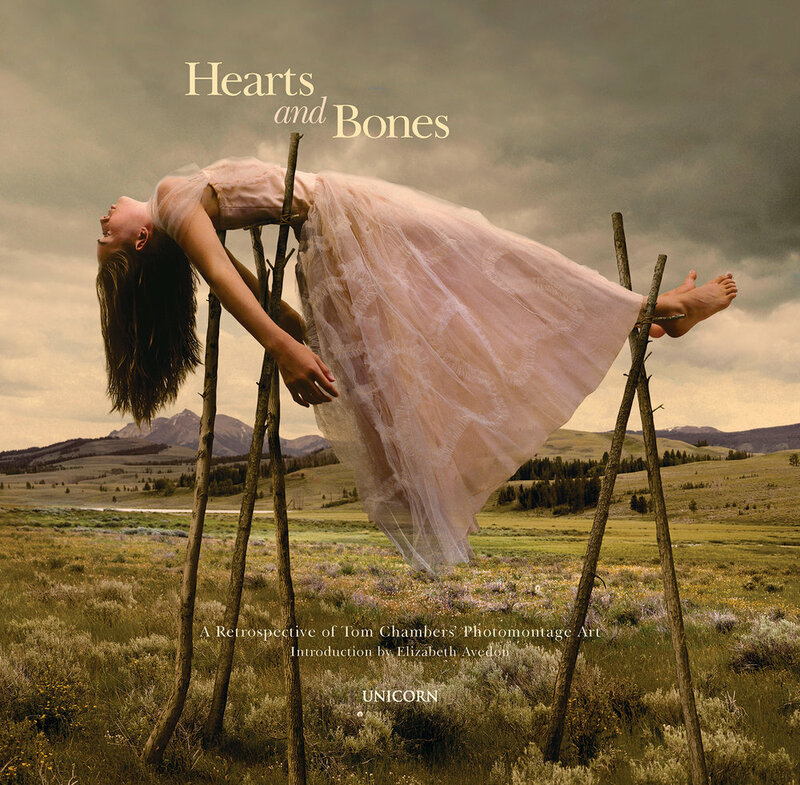 Hearts and Bones is marketed in bookstores, galleries and on Amazon. You may order a signed copy through the Photo-eye bookstore and gallery. Raised in a family alongside four brothers and the absence of sisters, my eyes were opened by my daughter’s growing up experiences from a girl to a teenager to a young woman. As a result, I am in awe of determined young women like my daughter who meet and negotiate both small daily hurdles and major life challenges. Their determination, empathy, and ingenuity in navigating a complex world make them heroines in my eyes. My photographic series Tales of Heroines is collection of stories about the lives of young women told through portraits. The subjects squarely face the viewer and the images employ a consistent format with a low horizon line, vertical orientation, and arched framing which invites the viewer into the story. Using magic realism, the power of storytelling emanates from the details in the photomontages. The stories are intentionally provocative enticing the viewer to engage with questions about the Tales of Heroines. Narrative Art refers to visual imagery which tells stories, engages the imagination, and stirs the emotions. These stories transcend culture and are relatable to all. My photomontage is narrative art which additionally uses magic realism. Magic realism creates stories which seem both true and believable, but likely are improbable. Using magic realism, “Still Beating” presents narrative imagery about the vitality of all living things whose survival is challenged. These living things are the embodiment of contrasts, both weakness of body and strength of emotions. As you hold a wild bird in your hand, you can feel both its fragile bones contrasted with the fortitude of its beating heart. And yet such creatures prevail through sheer grit. Witnessing the determination for survival is a source of hope that the natural world will endure. Exploring Iceland I stretched to look underneath, above, and around the edges of the landscape. What mattered was not right before my eyes, but delicately hidden in glaciers, volcanic rock, and ice, all of which have endured over many millennia. My photomontage series “To the Edge” celebrates the biodiversity of the natural world. Poet Allen Chamberlain inspired by my images, wrote this ghazal entitled Iceland, lines of which are incorporated into each image of the series. Table-land is set with stone lichen nets. Rust-brown rosettes, goblets sheave at the edge. Green luster of meltwater enfolds ice; Skeins of aurora, reprieve from the edge. Let grey ash imprison the horizon. Light and pink gentian in-weave at the edge. Does grief give way? Perhaps not. But enter— A land of chambered ice—reeved to the edge. All my life I have held a fascination with the animal kingdom, which began in my childhood growing up on a farm and extended into my adult years. On some inexplicable level I feel a special connection with both domesticated and wild animals. In this series Animal Visions my photomontages tell stories about these relationships. While working on Animal Visions I found myself circling back to the influence of magic realism. In the early 20th century Latin American writers and artists used magic realism to create images, which with a simple twist go beyond the expected into the unexpected. In this series I have constructed images to tell unfinished stories, which initially might seem true and believable, but likely are improbable. As I imagined in my childhood the animals and humans share a kindred connection. Renaissance artists affirmed the transformational nature of light in their classical paintings. Taddeo Gaddi and Giotto di Bondone of the Renaissance period painted breathtaking frescoes in which light created dramatic effects. Artists, such as these masters, inspired me to create photomontages that highlight the aesthetic power of light. Following recent travels in Italy, I was awed by the metaphysical nature of Tuscan light. The unique light accentuated the brilliance of the Renaissance artistic and architectural masterpieces. I came away with the understanding that light exposes possibilities and opens the mind to seeing things differently. Illumination, a series of photomontages, illustrates stories about personal beliefs and seeing things in a different light. Twenty-five years ago I traveled freely throughout the Mexican countryside where I relished a warm, welcoming and slow-paced style of living. I was heartened by the physical beauty of the landscape and the simple, pure lifestyles shared by both the Hispanic and indigenous people of Mexico. A sense of spirituality and magic were imbedded in their religious practices, crafts, art, dance, and literature. Recently, I returned to Mexico where I experienced a country teetering on the brink of change created by increasing political and economic challenges, and exacerbated by the trappings of global consumerism. The Mexican people appeared handcuffed by demands largely outside of their control and threatened by the potential loss of their cultural richness. Sensing that little time remains to photograph the beauty of Mexico, I have created the series "Dreaming In Reverse" to express both my concern for cultural loss, as well as my appreciation for the inherent loveliness of Mexican life. Employing magic realism, an art genre used in the early twentieth century in Mexico, I have created images of Mexico which seem true and believable, but also perhaps improbable. These photomontages illustrate my dreams for the Mexican people that they are able to retain the authenticity of their culture. In my eyes horses represent that which is beautiful and sacred in nature. In particular, the noble Marwari horses from India have captured my attention after an inspirational encounter with them. Known for their loyalty and bravery, the Marwari were considered divine beings as far back as the twelfth century. Victimized by difficult economic times, poor horse management, and global warming, the Marwari horse population was almost decimated late in the twentieth century. Fortunately, efforts currently are being made to preserve the Marwari breed. prosperity shared by innocent children and animals. The animal kingdom and mankind engage in an ongoing dance of co-existence which results in a predictable tension. This tension has escalated with man's increasing disregard for the fragility of the environment and abdication of his responsibility to care for the earth. One particular issue is global warming which has had a significant impact on all living things. Climate changes will minimally upset and perhaps ultimately destroy ecosystems. As a result, mammals already compete for survival in smaller and smaller spaces, while temperature changes alter migration patterns of fish, birds, and insects. I feel strongly that the cumulative impact of negative environmental changes cannot be ignored. Having grown up on a Pennsylvania farm, I am inspired by Andrew Wyeth's rural landscapes, characterized by subtle, but powerful emotion. I hope to strike a similar emotional connection in the viewer by illustrating a disturbed world that has been thrown out of balance as a result of climate changes created by man's blind disregard in fulfilling immediate, self-serving needs. These photomontages are composed of animals, children and adults, all of which are potential victims and at risk. With time, adolescents begin to abandon the natural, untamed state of childhood for the artificial pretenses of adulthood. After my own daughter's arrival at the complexities of her sixteenth milestone, this juxtaposition captured my attention. In composing a variety of stark, woodland settings in contrast with a billowy dress or other man-made articles, I explore the dichotomy between what is natural and what is fabricated. Why do people costumed in formal dress seem so omnipotent on the street, yet so vulnerable in the wild? Each of these photomontages explores a place where unexpected circumstances collide. During a trip to Mexico I was intrigued by small traditional paintings called ex votos. Ex votos are Mexican folk art paintings often created on tin, copper or wood. They illustrate an occasion when in response to a prayer for help or guidance, the prayer was answered or a miracle occurred. These miracle paintings honor the power and mercy of the saints. Ex voto subjects range from common daily occurrences to truly dramatic events. The elements common to all ex votos are a picture of the miracle, an image of the saint to whom the ex voto is dedicated, and a brief description of the miracle. Through digital photography I have taken a different approach to the ex voto art form. Normally photography is a method of documentation or a means of recording specific physical moments in time. My work is not used to document, but to illustrate photographically the fleeting moods that can’t be captured by a traditional camera or seen by the naked eye. With photomontage, I create ex votos that also honor a deity – the one for imagination. © Thomas W. Chambers. All rights reserved.